Appliance Gadgets and Useful Appliance Parts- CLICK HERE! Washing Machine Floodstop - Gotta love this gadget. How many times did something get stuck in the drain and the washing machine flooded leaving a big mess (at least) and sometimes even water damage. 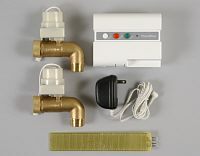 he floodstop automatically shuts off the water supply to the washing machine and sounds an alarm when a few drops of water make contact with the water sensor. Whether caused by a burst hose, or an overflowing washing machine the Floodstop will automatically close the valves and shut off the water supply. Vegetable Bin Liner for Refrigerators - A plush layer of cushioned foam lines your crisper bins to prevent bruising and spoilage. Allows air to circulate freely to help keep fruits and vegetables fresher longer. Cut to fit your specific bin and model. Not really a gadget - but a great garbage disposer. 1/3 HP Continuous Feed Disposer with Cord (Magic Chef) - Magic Chef Food Waster Disposer - one of our favorites - features a 1/3 HP induction motor. Quick-lock mounting collar speeds installation. Two stainless steel swivel impellers. Attached power cord included. One-year limited manufacturer's warranty. 25 feet of 14 gauge high temperature wire, 3 separate conductors - white - red - black. Sil-a-blend system includes a plated copper conductor, silicone high temperature insulation and an embedded glass braided covering all jacketed in another layer of silicone insulation. Replaces plastic, rubber and glass braid wire. Rated to 600 volts, 36 amps and 392 degrees F.
A specially formulated product for removing scale deposits from ice machines having nickel-plated or tin-plated evaporators. Acceptable for use on Manitowoc and other manufacturers using nickel plated evaporators. 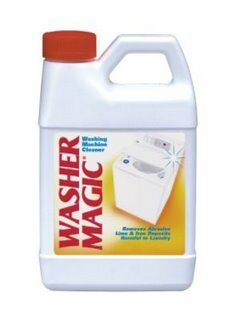 It is available in pints an d gallons, and it mixes to form a green cleaning solution which makes rinsing easier. Specially formulated food-grade product, removes scale deposits from ice machines with nickel or tin-plated evaporators. Dishwashers Can Reduce Water Usage by More Than 80 Percent- CLICK HERE! The United States could save as much as 245 billion gallons of fresh water annually if everyone used a dishwasher instead of doing the dishes by hand. That's enough to provide drinking and cooking water for every household in America each year. These facts are some of the findings in the Electrolux WaterSavings Web site (www.electrolux.com/watersavings_us) presented by Electrolux - a global leader in home appliances. The Web site is based on findings by the U.S. Department of Energy's ENERGY STAR program, as well as consumer research by Electrolux, which have determined that it takes less than five gallons of water to do a load of dishes in an Electrolux ENERGY STAR qualified dishwasher, while handwashing an equivalent number of dishes requires 27 gallons of water. This means a household in the United States could save 4,730 gallons annually by using a water-efficient dishwasher, such as the Electrolux. If all households in the U.S. today that are doing dishes by hand switched to a modern dishwasher, a total of 245 billion gallons would be saved each year. The amount of water saved by one household making the switch would be enough to provide the drinking and cooking water for 2.5 other households. By making the switch to a dishwasher, residents of the New York City metropolitan area could save 13,863,402,851 gallons each year, enough to fill more than 35,400 Olympic-size swimming pools. The people of the state of New York could conserve enough water annually to fill 67 stadiums the size of the Pasadena Rose Bowl. That's in addition to the estimated 229 hours each year saved by a household using a dishwasher instead of washing dishes by hand. Even switching from a 10-year-old dishwasher to a new one would save the household nearly 30% of the water used. "Water is becoming an increasingly scarce resource in many parts of the world, including the United States, and we all have a responsibility to use this precious resource more carefully," said Henrik Sundström, head of sustainability affairs at the Electrolux Group. "Everyone can play a role in solving the challenge of water scarcity: consumers, by adopting new technologies and making smart choices in their daily life; policymakers, by encouraging consumers to do so, for instance with legislation and incentive programs that speed up the replacement of inefficient appliances; and industry, by reducing water use and emissions, and equally importantly, developing and offering products that are continuously more efficient and climate smart," Sundström concluded. Today, 1.1 billion people in the world do not have access to adequate clean water to meet their basic daily needs, and 2.6 billion do not have proper sanitation facilities, according to the Food and Agriculture Organization (FAO) within the UN. The UN warns that by the year 2025, between 2.6 and 3.1 billion people could be living in either water-scarce or water-stressed conditions. This already poses a serious threat to health and welfare, and also to agriculture and industry. To see how much water could be saved in major cities and countries around the world, visit www.electrolux.com/watersavings. To learn more about Electrolux appliances, visit www.electroluxappliances.com. To find an Electrolux Repair part, click here. Electrolux is a global leader in home appliances and appliances for professional use, selling more than 40 million products to customers in 150 countries every year. The company focuses on innovations that are thoughtfully designed, based on extensive consumer insight, to meet the real needs of consumers and professionals. Electrolux products include refrigerators, dishwashers, washing machines, vacuum cleaners and cookers sold under esteemed brands such as Electrolux, AEG-Electrolux, Zanussi, Eureka and Frigidaire. In 2008, Electrolux had net sales of US $15.9 billion and 55,000 employees. Canton appliance repair Web site extends charity program- CLICK HERE! On March 19, RepairClinic.com sponsored a corporate table to benefit Ypsilanti Meals on Wheels at the annual “Spring Fling” Benefit Dinner at the Marriott Eagle Crest Resort in Ypsilanti. For the past 12 years, the nonprofit organization has held the dinner to raise money for their program which delivers meals to needy seniors and disabled individuals in the community. Local celebrities, including faculty members from Eastern Michigan University along with community and government officials, posed as servers. Patrons happily contributed generous tips in return for the excellent service provided at the hands of local VIP’s. The event was well-attended by many in the local area, including a group of Repairclinic.com employees, representing the recently established RepairClinic.com Outreach program. Outreach is a company-wide effort established to encourage volunteerism and community involvement among RepairClinic employees throughout southeast Michigan -- where the company headquarters is located -- a region where the economy has presented many challenges to families and charitable organizations. The internal Outreach program is made up of RepairClinic.com employee volunteers who combine their hard work with company resources to do their part in the community. This charitable initiative is very near and dear to the hearts of those on the RepairClinic.com management team. Said CEO Larry Beach: "Several on the team have served on the boards of local charities and believe it is important to reach out to the needy in the community. " As a result, the company‘s Outreach program has supported several local charities, such as: Hope Clinic, Make a Wish Foundation, Canton Make a Difference Day, Earth Day Spring Cleanup, and the Belleville Eagles Charity. Other upcoming events where Outreach participants will be involved include: Canton Christmas in Action Program on April 25 -- a program where volunteers assist income-qualified seniors and individuals with disabilities with home cleanup and/or fix-up projects; The American Cancer Society Relay for Life in Canton, at Heritage Park, May 16-17, a 24- hour event that includes a continuous walk to raise money for cancer research, a festival setup, and ceremonies to honor cancer survivors and those lost to the disease. Outreach has also been involved in several projects with Hope Clinic in Ypsilanti where RepairClinic.com’s CEO, Larry Beach, is a board member. Hope Clinic is an organization that provides many services to local families including: free medical care, free dental care, and hot meals and groceries for individuals and their families. The Outreach program has made a special effort to provide funding to smaller projects at local schools in addition to family-focused projects, such as providing money, supplies, and holiday gifts to local food banks. Now celebrating its tenth anniversary, RepairClinic.com was founded in Canton in 1999 and is the most comprehensive online resource for home appliance parts, do-it-yourself repair help and information. The site features more than 80 appliance brands, including Kenmore, Whirlpool Appliance Parts, Maytag Parts, GE, Frigidaire, and LG—across 16 appliance types (e.g., washers, dryers, refrigerators, stoves, ovens, and dishwashers). Do-it-yourselfers use the intuitive PartDetective to find the part they need or the leading-edge service, RepairGuru, for customized, free repair help online. Appliance parts are stocked in a 72,000-square-foot office and warehouse and shipped the same business day. Happy Easter from the Appliance Repair Folks at www.ApplianceLife.com- CLICK HERE! We'll all get back to work tomorrow. Monster Appliance Coupons MonsterAppliance.com is the source for small appliance at monster prices. Our team of IT experts continuously monitors and updates our website. In addition, we monitor the market on a daily basis for new products and price fluctuations to provide our customers with the newest products at the possible prices. Please give us feedback on how successful these coupons were for you. We want to only offer great appliance deals and coupons from reputable stores. Sears Parts Direct Appliance Parts- CLICK HERE! ApplianceLife has worked with a number of part supply stores like Repair Clinic Appliance Parts - and we are proud to announce a new relationship with Sears Parts Direct. Currently, you can save 10% on all parts until the end of May - CLICK HERE to activate the coupon. Use the code: 90055 when checking out. Sears PartsDirect has over 7 million appliance and tool parts for all major brand appliances, power tools and more. No matter where you purchased the product. Parts are available from more than 500 manufacturers. On the Sears Parts Direct website, there are more than 760,000 schematic diagrams of major brand appliances to ensure you find the right repair part every time. Appliance repair parts are available for large and small appliances, floor care products, washer parts , dryers, lawn care products, power tools, garage door openers, heating and cooling systems, electronics, sewing machines and much more. Sears PartsDirect also offers a wide selection of accessories to extend the life of your products, enhance their performance and enhance your enjoyment of them. Brands include: GE, Whirlpool, Briggs & Stratton, Husqvarna, Maytag, Craftsman, Kenmore, Bosch, Sony, Panasonic, Singer, ProForm, and many more. In many cases, your part may be substituted because the original is no longer made. The manufacturer has authorized a substitution of the original part with an original equipment manufacturer part. While the substituted part may be different in appearance, it has been authorized by the manufacturer and is guaranteed to work with your product. Sears Parts Direct will clearly indicate if this is the case for the part you are looking for.